Cubic Zirconia, abbreviated as CZ, is the worlds best selling diamond simulant. It is a man-made gemstone that is not only hard, but optically flawless and colorless so a perfect choice for jewellery! Produced in a range of colours including blue, pink and purple, cubic zirconias sparkle in earrings, pendants and rings. Their affordable price tag and diamond-like appearance mean CZ are used in fine jewellery and a choice of brides for wedding jewellery. Their strength and durability mean they will retain their brilliance for years to come with proper care. 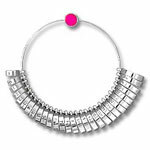 To keep your CZ jewellery in beautiful condition always clean regulary and store individually to avoid scratching. A little dishwashing detergent and a soft cloth for polishing is a simple way to keep your cubic zirconia jewellery clean.